I stumbled on another great find while prowling through the bookshops in Texas a few weeks ago. This one is a set of two Enciclopedia Larousse de los Pequenines: Los Adjetivos and Los Verbos. These books are a treasure for children. Inside, each book lists words in alphabetical order and they are defined by a quote from famous Latinos, such as Gabriel García Márquez, Miguel de Cervantes, Carlos Fuentes, Sor Juana Inés de la Cruz, and José Martí, just to name a few. Each word is also accompanied by a small illustration showing an example of the verb or adjective. 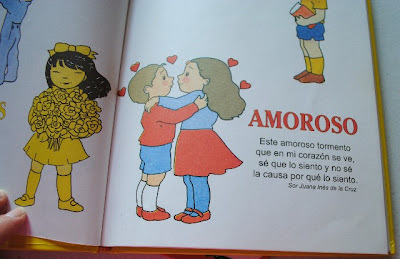 This book is written completely in Spanish and I have not seen an English version. They are first editions, printed in 1986 and 1987. Both were written (and illustrated?) by Agnés Rosenstiehl. 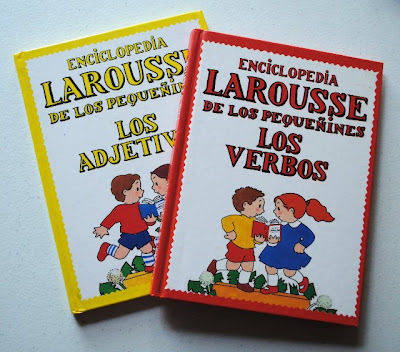 I haven't been able to find any others online, though I have found copies of Diccionario Espanol - Ingles on Amazon. If you’d like to purchase this set, they are available on a first-come, first-served basis. Just visit the Mommy Maestra Specials page.